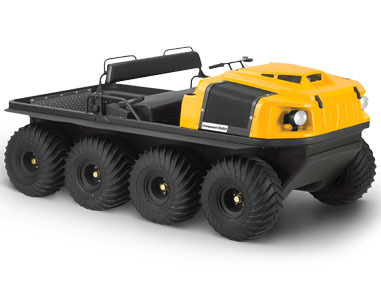 This model is powered by a 24 HP three-cylinder Kohler diesel engine, providing more low-end torque than Argo’s gas models while simplifying fuel logistics at remote work sites. An Admiral transmission with variable steering brakes is paired with standard gearing for good all-around performance. Maximum payload for this model is 905 lbs., and it can tow up to 2,000 lbs. This model comes with a 4,500 lb. Warn winch that can be mounted to the front of the vehicle or to the hitch receiver. Headlights and front-mounted floodlights are also included.